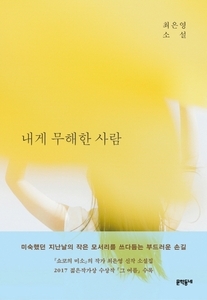 Choi Eun Young's novel. Shoko's Smile, an intense debut film entitled "A Writer Who Writes a Deep Understanding of Humankind" (novelist Kim Yeon-soo) and an "Essay on the Birth of a Talented Artist" (novelist Kim Young-ha) In the next two years, he will show his second novel. In December of 2016, , which has been highly regarded by both writers and readers, has been selected as one of the "Novels of the Year" selected by 50 novelists for domestic and foreign novels that year. . The public interest in the first novel of a new writer is still in progress. This fact has been a great burden for the artist. In an interview, "I think it is a futile expectation for further development of the novel, but I want to try harder now ... (...) I want to be a writer for a long time," said the young novelist, He responded as "novel" to his gaze, which was a mixture of anticipation and concern for himself. The result of retiring after seven carefully published novels that have been published so far, from scratch, is . Songs that are heard many times at a particular time have a strong workforce, and by listening to the song again, memories of the time are drawn together. The seven works in The Harmless Man are novels like those songs that dominate us at a time, which shines in front of us some of the scenery that was forgotten when the play button was pressed..